LA JOLLA—Over the past several years, CRISPR-Cas9 has moved beyond the lab bench and into the public zeitgeist. This gene-editing tool holds promise for correcting defects inside individual cells and potentially healing or preventing many human ailments. But the Cas9 system alters DNA, not RNA, and some experts believe that being able to modify RNA ultimately may prove just as useful. 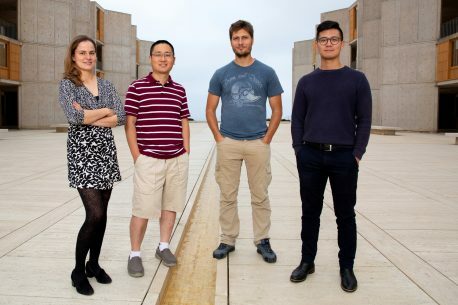 Now scientists from the Salk Institute are reporting for the first time the detailed molecular structure of CRISPR-Cas13d, a promising enzyme for emerging RNA-editing technology. They were able to visualize the enzyme thanks to cryo-electron microscopy (cryo-EM), a cutting-edge technology that enables researchers to capture the structure of complex molecules in unprecedented detail. The findings were reported September 20, 2018, in the journal Cell. Derived from genes originally found in bacteria, CRISPR has been described as “molecular scissors” or a “word processing program for living cells.” It swaps out one segment of genetic code with another. In the CRISPR-Cas9 system, Cas9 is the enzyme that cuts DNA. Having editing tools for RNA, however, would allow scientists to modify a gene’s activity without making a permanent—and potentially dangerous—change to the gene itself. Earlier this year, Konermann and Helmsley-Salk Fellow Patrick Hsu published another paper in Cell discovering the family of enzymes called CRISPR-Cas13d and reporting that this alternate CRISPR system was effective in recognizing and cutting RNA. The team also showed this tool could be used to correct a disease-causing protein imbalance in cells from a person with dementia. The new study, a collaboration between the Lyumkis and Hsu labs, built on the discovery of the Cas13d family and provides the molecular details that explain how it works. The team used cryo-EM to reveal new details into Cas13d by freezing the enzyme in different, dynamic states, allowing researchers to decode a range of activities instead of just seeing one activity at a single point in time. The paper’s other authors were Nicholas J. Brideau and Peter Lotfy of Salk; Xuebing Wu of the Whitehead Institute for Biomedical Research; and Scott J. Novick, Timothy Strutzenberg and Patrick R. Griffin of The Scripps Research Institute. This work was supported by a Howard Hughes Medical Institute Hannah H. Gray Fellowship; a Helen Hay Whitney Foundation Fellowship; National Institutes of Health grants NIH-NCI CCSG P30 014195, DP5 OD021369, DP5 OD021396 and U54GM103368; and the Helmsley Charitable Trust.